Premiership clubs voted on Tuesday. PREMIERSHIP CHAIRMAN IAN Ritchie says allowing a takeover of English rugby’s top tier is “not the preferred option”, but he admitted the cash-strapped league is looking for investment. Former Formula One owners CVC Capital Partners are believed to have expressed interest in buying a £275 million (€309 million) controlling stake in the Premiership. England’s leading clubs are struggling financially, with Worcester losing £8 million and Harlequins £6 million in the past accounting year, while Exeter were the only Premiership club to make a profit. 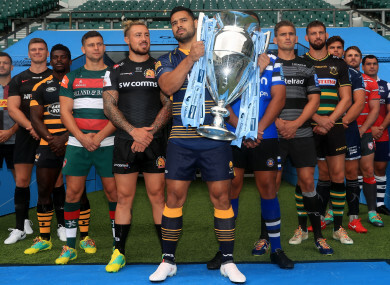 Against that uncertain backdrop, Premiership Rugby voted unanimously on Tuesday to listen to all new investment offers and chief executive Mark McCafferty expects quick movement on a potential deal. But England’s top teams do not want to sell on a majority stake in the Premiership and will attempt to retain overall control of the product. “We had a very positive board discussion and considered a range of alternatives to accelerate investment in the club game,” Premiership Rugby chairman Ritchie said. “This is all about how do we engage further in growing from a strong base into something that develops even further? CVC Capital Partners reportedly bid for a 51% stake in Premiership Rugby. The Premiership clubs would stand to receive a multi-million pound windfall from any investment deal, which would help offset financial losses surrounding increasing revenues including player wage inflation. “Ian (Ritchie) and I have a good mandate from today about what the shareholders want to see. So that’s given us exactly the clarity we want,” McCafferty added. Email “Cash-strapped Premiership clubs decide £275 million takeover 'not the preferred option'”. Feedback on “Cash-strapped Premiership clubs decide £275 million takeover 'not the preferred option'”.